The Hellfire Caves were built in 1750 by Sir Francis Dashwood, founder of the infamous Hellfire Club. Pagan rituals and Devil worship were rumored to have taken place in this secret location deep beneath the West Wycombe Hills. 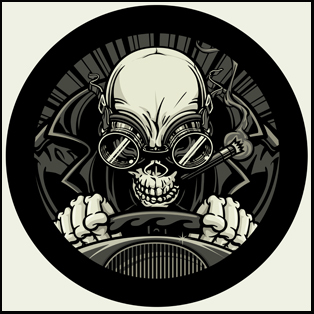 Although the club last met over 250 years ago it is believed that some of its patrons still wander the haunted tunnels. West Wycombe is a small village in the Berkshire countryside, a few miles away from High Wycombe which is the nearest town. The main street is composed of a few pubs and Victorian tea shops and beyond that is the entrance to West Wycombe manor which is still owned by the descendants of the Hellfire Club founder, Sir Francis Dashwood. If you make a right turn just past the manor and head up the hill there is a narrow road and a sign that says “The caves”. I first heard of the Hellfire Caves almost twenty years ago after reading a book called the Hellfire Club, but there is also a 1960’s horror movie of the same name staring Peter Cushing. More recently the Caves have become better known for their haunting’s, partially as a result of the British TV program Most Haunted filming an episode there. The Caves entrance is about a 1/4 of a mile along a narrow single track road, and for such a popular attraction they have a very small car park, with only enough room for about half a dozen vehicles. I parked the car and headed towards the tunnels. Framing them is a Gothic style recreation of a ruined church that stretches up above the archway that leads to the caverns below. The motto “Fay Ce Que Vouldras” is etched above, this is actually the same motto used in later years by occult practitioner Alistair Crowley, and translates to “Do what thou Wilt” .Outside are a few tables and there is a small gift shop and tea room selling home made cakes. I paid the s mall admission fee and head into the Hellfire Caves. It was a warm spring day, and as you would expect within the caves it becomes far colder. Just inside the entrance there is an exhibition about the history of the tunnels and an accompanying audio narration by what is supposed to be Sir Francis Dashwood himself. Sir Francis was born into a wealthy family, attended Eaton College, and in 1741 was elected as MP in the House of Commons. He later went on to form the Hellfire Club which included a future British Prime Minister, The Prince of Wales, The Earl of Sandwich, and various prominent poets and politicians. Whether Sir Francis Dashwood was a Satanist or just a person that held strong views against the Catholic Church remains the subject of dispute. The tunnels are dimly lit, and it takes some time to adjust from the bright sunshine outside, but the concrete floors are not slippery and there are only a few places where the caves become narrow or difficult to walk through. They were actually abandoned for many years until being reopened in the 1950’s as a tourist attraction, at that time before electric lighting was installed you could buy a candle and explore them in what must have been almost total darkness. 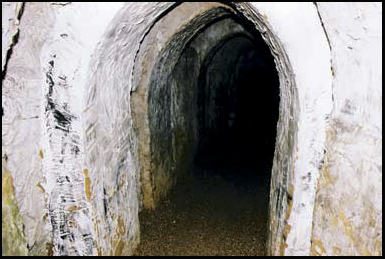 One of the main ghost stories associated with the tunnels concerns Paul Whitehead, a famous poet of the day, and a prominent member of the Hellfire Club. It seems that when he died he still didn’t wish to leave, and in his will he requested that his heart would be embalmed and then left in the mausoleum on the hilltop above, and this is where it remained for several years until it was stolen. It is believed that he still haunts the tunnels and has been seen on numerous occasions. 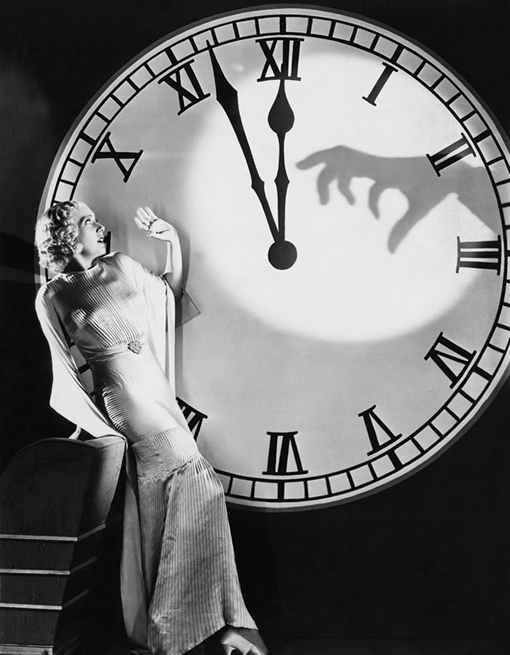 The other most popular tale takes various forms but it is about young girl dressed in a wedding gown who was lured into the tunnels as a prank and then stoned to death. I went on through the first section of the Hellfire Caves, ahead are a series of chambers and eventually a small river just before the final stretch of tunnel. I had gone a few hundred feet into the cave, and at this point the tunnel temporarily splits into two separate passages so its easier for people coming from up ahead to bypass each other. I took the right hand track and the tunnel soon opens up into what was the first of several large underground chambers. This particular one was known as Franklin’s cave, it’s a massive arched cavern that is named after Ben Franklin the American president, who was a friend of Sir Francis Dashwood and also believed to be a member of the Hellfire club. There is also a gaudy life size figure of Franklin hidden behind one of the inc lines in the cave, which is one of several throughout the complex depicting the various characters and events that once occurred there. Since the program Most Haunted filmed here there are now several commercial groups that enable people to ghost hunt in the tunnels overnight. 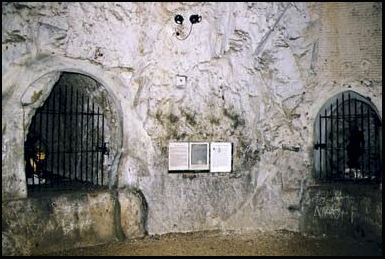 But the reputation of the caves being haunted was undoubtedly enhanced from the allegations that the Hellfire club practiced Black Magic rituals, although in reality they where more likely to have been more Pagan in origin. The Clubs more outlandish rituals may have actually taken place in Median Abbey a few miles away until it burnt down. As you go deeper into the cave the tunnels slope gently downwards, above you is the chalk hillside and on top of the hill is a church and graveyard. But despite being so far underground, the tunnels don’t feel particularly claustrophobic as they are fairly high and wide, and although Sir Francis was responsible for enlarging and extending the caves they were actually in existence for several hundred years. I headed on into what was the middle section of the caves and again they open up into a larger area, on this occasion into what is referred to as the Banquet Hall. The larger caves are better lit then the tunnels themselves and would have been a spectacular place for a banquet, and you can follow in the footsteps of the Hellfire Club over 200 years later as the Hall is now available for private hire. I passed through the Banquet Hall and continued along the tunnel through to the area known as the Triangle and then onto the Miners cave. Up ahead a stream intersects your path, this is the River Styx. In the time of Sir Francis Dashwood it would have been crossed by boat, but now there is a narrow wooden bridge. Either side, spotlights illuminate the stream as it disappears into the darkness and small pockets of mist rise over the gently flowing water. I’m almost at the main chamber known as the Inner temple, it is this point that the church is said to be directly overhead. Several hundred feet above on the top of the hill there is also the Dashwood Family mausoleum where Sir Francis Dashwood lies. The Inner temple was supposed to symbolize Hell, and the Church on the Hill directly above it was meant to symbolize heaven. The Inner temple being the last cave in the tunnel and the most secluded was where some of the more extreme rituals and practices of the Hellfire Club were said to have taken place. Like the other chambers the Inner temple contains figures depicting members of the Club, this is also where the cave dead ends. One thing you will notice throughout the caves are that there are various symbols and carvings in the rock, some of them denote the numbers 22 or 34 in roman numerals, others are just masks or faces, some of which have been labeled demonic in appearance. You also become aware of how quiet the chamber is and unlike you may expect there is no echo. The journey here had only taken around 20 minutes, there were only a handful of people around on this occasion, but it can get very busy during the summer months. I made way back up along the tunnels, until up ahead I could again see sunlight shining through the doors at the front entrance. I got back into the car, and followed the road onward past the Hellfire Caves as it curves around to the top of the hillside for about half a mile. 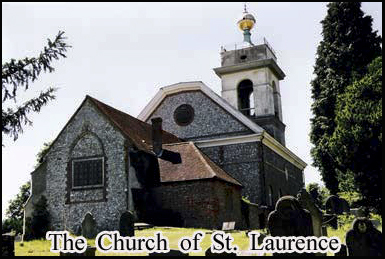 It is here that you can visit the Church of St Laurence that is directly above the caverns. The first thing that you notice is that on the steeple is a huge gold ball, which can be seen for miles away, it is actually big enough that it can hold several people. The gold ball was meant to symbolize the Sun God, which is one of several indicators that Sir Francis may have had an inclination towards Paganism rather then Christianity. I parked the car and walked around the side of the church to wander through the graveyard and look at the tombstones. Although there are many from the 19th Century, there are several more recent ones, and the Church is still attended by the local parishioners. Although an alleged Satanist Sir Francis at one point actually spent a great deal of money resto ring the church, which again seems contrary to the legends of the Hellfire Club. From the rear of the graveyard on top of the hillside you can look into the valley below and see the current estate and house that belongs to the descendants of Sir Francis Dashwood, West Wycombe Manor. About 300 feet below you are the Hellfire Caves. I walked to the rear of the church and followed a step track down the hill to left. In front of me is the Dashwood mausoleum it’s a vast 6 sided structure with 12 columns where Dashwood and several members of the Hellfire club are buried. It is a weathered stone structure clearly inspired by the Italian architecture Sir Francis must have witnessed during his early trips to Europe. There are iron bars and a locked gate that prohibit you from actually setting foot inside, but you can walk around most of the perimeter to peer at the ancient crypts that lie inside. The last stop on the tour was West Wycombe Manor, which is a short drive about half a mile back down the hill and across the main road running through West Wycombe village. I took a brief tour of the Manor house, which is open to the public on certain days, although several sections are inaccessible as they are still the private residence of Sir Francis Dashwoods descendants. The grounds are extensive, with a fishing lake and several Victorian follies. I walked over to the far edge of an avenue of trees on the perimeter, and beyond I could clearly see the Church with the gold dome and the mausoleum on the hillside. The sinister nature of the Hellfire Club and the caves where they met, have been emphasized over the years in books, and movies and now with the advent of T.V programs and tours that focus on their connection with the paranormal their reputation continues to grow. Hey Buddy!, I found this information for you: "Hellfire Caves". Here is the website link: https://www.chasingmidnight.com/hellfire-caves. Thank you.